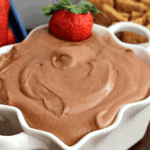 Chocolate Almond Cheesecake Dip ~ Creamy, dreamy cheesecake dip loaded with chocolate and a hint of almonds! Using a hand mixer whip heaving cream until stiff peaks form in a mixing bow. Mix cream cheese and powdered sugar until smooth in a separate mixing bowl using hand mixer. Mix in Chocolate Almond Hershey's™ Spreads until blended. Gently fold in whipped cream mixture until blended. Serve with strawberries and graham crackers.